Two movies have just opened that filled me with much relief that smellovision never caught on. Both films are jam-packed to the brim with characters so masculine they ooze hormones to the extent their odor would grow hair on your chest if it was released into the auditorium. In the new Australian thriller The Rover, written and directed by David (Animal Kingdom) Michod from a story by Michod and Joel Edgerton (yes, that Joel Edgerton), it’s ten years after “the collapse”, a catastrophe that is never (to the movie’s credit) clearly defined, but has resulted in a Down Under that is in a near state of anarchy with the military standing in for the police; gas and food in short supply; the American dollar being the only trusted currency (hey, it could happen); and nobody seeming to have taken a bath in years. It’s a bleak landscape in which perhaps the most haunting visual is a series of people seen from a distance who have been crucified on telephone poles for reasons never revealed. The story revolves around Eric, a man who takes a break from driving his car and stops at a bar in the middle of nowhere (as if he had a choice—there doesn’t seem to exist a location in this film that isn’t in the middle of nowhere). You can tell he’s the hero because he speaks about as much as Clint Eastwood does in a spaghetti western, which is probably an apt reference for the movie as a whole (maybe we should start calling these shrimp on the barbie westerns). His car is stolen when a group of thugs crash theirs trying to escape some sort of conflict with the militia that went not so well to say the least (they had to leave behind the younger brother of one of the thugs, uncertain if he was dead or not). Apparently this action of theirs is what is called in the state of the art “a bad idea”, because Eric wants his car back. I mean, boy, does he want his car back, and he’s willing to do anything he can to get it (and no one, not even a midget arms dealer, is going to stop him). Things get complicated when the younger brother, Rey, shows up only wounded, and joins Eric in going after his brother and the others, seeking revenge for being deserted. In many ways, that’s the gist of the story. The two get caught up in various diversions along the way (like a doctor who keeps dogs in cages because if she doesn’t, people will use them for food, and a series of encounters with soldiers who are so shockingly bad at their vocation it seems that anybody and their sister can get the drop on them). The Rover is one joyride of a road movie that is always on high octane (which is, in many ways, ironic since gasoline is so expensive). Michod keeps the film focused and lean, filling it with small scenes of taut rigidity while playing it out against huge vistas of dystopian landscapes. It’s a film where the dialog is spare, the visuals are spare, the plot is spare, the characterizations are spare, but the tension is anything but, a minimalist post apocalypse of a movie. Eric is played by Guy Pierce, who has worked with Michod before in Animal Kingdom. Here Pierce puts his steely baby blues to good effect. He’s a mean, unclean killing machine. And the less he says, the more menacing he becomes. Rey is played by Robert Pattinson, he of Twilight fame. He has, before this, in films like Cosmopolis, Water for Elephants and Bel Ami, desperately tried to prove he could do more than play a hopelessly angst filled teen, but so far with no success. Well, perhaps he’s found his Svengali in Michod. I mean, I don’t know how else to explain it because Pattinson is more than quite impressive here. With buzzed cut hair, grizzled ten o’clock shadow, a body so grimy you want to put a clothespin to your olfactory senses, a convincing Southern accent, and more tics than you can shake a stick at (like having so much trouble speaking that every time he tries to say something, he jerks around as if he is about to have a fit before getting a look on his face that suggests he’s about to vomit), he disappears into the character in a way that is a bit scary. As good as he is, and his performance does deserve attention, I don’t know if it means anything beyond this for Mssr. Pattinson’s career. In a role like this, where he employs a complete Daniel Day Lewis/Joaquin Phoenix makeover, there is something exciting and vibrant about him. But in most of his films where he has to be Robert Pattinson, well, he doesn’t really bring a lot to the plate. He’s incredibly good looking (almost frighteningly so), but I’m not quite convinced that he’s one of those actors (like Brad Pitt) who has that thing where he can be himself on celluloid and be effective. 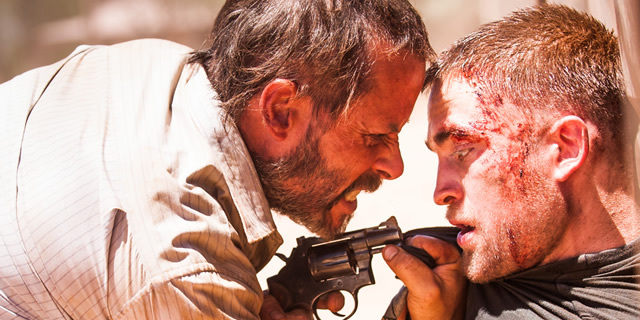 In the end, though, as intriguing and involving as The Rover is, I’m not convinced it really is much more than intriguing and involving. It’s a curiosity, but I’m not sure it totally rises above what it is, though what it is is often effective. In many ways, it works very well on its own terms. How you ultimately feel about it may depend on how you feel about the final scene where it is revealed why Eric wanted his car so much he was willing to put everybody’s life, including his own, on the line for it. If your reaction is one of “Oh, wow, I get it”, then the film will probably work very well for you. But if you see it, as I did, as a punchline for a joke that falls rather flat, then you might end up a bit let down and disappointed. With Scoot McNairy of Monsters and Killing Them Softly as the older brother and Antony Partos backing everything up with a moodily effective little music score. Yaron, the lead character of the not so new Israeli film (it didn’t find its way it to our shores for a few years after it was made) written and directed by Nadav Lapid, is a bit of a narcissist and mirror queen (he can’t seem to go by a reflective surface without taking a look at himself). He’s one of those guys who has his pregnant wife count out his pushups that he does on the spur of the moment (while he’s in his underwear, no less) and who can find a bar to use for pull ups when he’s in an elevator going up to see his mother, if he’s not carrying his wife up the stairs for mom’s birthday because the lift isn’t working. You know, a manly man’s man of a guy. And as a member of an anti-terrorist group, he is surrounded by a lot of other manly men guys as well. You can tell how manly men they are because when they meet, they give each other that straight man sort of chest thumping half hug and slap each other on the back a couple of times (I suppose this isn’t fair in a way, because this sort of greeting seems to be common in Israel; at the same time, you can tell that he and his friends’ greetings are much more manly because you can hear their slaps ten times louder than you can anyone else’s). They’re such manly men they can sit in a group and never say a word, whether at a backyard barbeque or at an outdoor café, and instead be silent while basking in the glory of their sunlit masculinity. They’re such manly men they play this game where they rush at each other and collide into one another like a crash of rhinoceri and for no discernable reason except that it’s what they do because, well, they’re manly men, you see. They’re such manly men that if they catch you stealing flowers from the grave of one of their own, they will gang up on you and beat your mercilessly. And Yaron’s also the kind of manly man who will flirt with a fifteen year old waitress and have her touch his gun (get the symbolism anyone) with the suggestion that they do the deed (the movie is oddly ambiguous here—either he fucks her, which says something about his character, or he doesn’t, which means the scene serves no purpose in the movie). It all comes perilously close to a parody at times, though, as far as I can tell, Lapid is deadly serious. And oh, right, yes, before I forget, I suppose I should also mention that he’s also the sort of manly man (and his group too) that after they botch a mission and kill two innocent people and put another in the hospital while taking out an Arab terrorist, he and the others make a decision to get the member who has a golf ball size tumor in his head to take the fall for it since the government either won’t prosecute while he undergoes treatment (until no one will care anymore) or he’ll die. Yeah, he’s also that kind of a manly man. And then the movie stops being about him and for the second act, it focuses on a group of terrorists, but this time they are not Arabs, but homegrown, children of Israel who don’t see their nation as Yaron does, as the most beautiful country on earth, but as a failing society where the rich get richer and the poor get poorer. But they are also the sort of home grown who are more dilettantes than real terrorists, who come from privileged backgrounds, or at least solid working class ones, and who wouldn’t know a poor person if they met one. This part also comes close to parody, much closer than the earlier Yaron driven scenes, as this group, who don’t seem to be the brightest group of bulbs in the bin, become more and more the gang that couldn’t shoot straight. Their big plan is to crash the wedding of a wealthy businessman and take three billionaires hostage, holing themselves up in a dead end room with no escape, demanding TV time. Not only do they actually think they are going to get this demand met, they seem to sincerely believe that the various stations will interrupt their regularly scheduled program just so these nimrods can read their manifesto, and that once they do, the oppressed masses who control the means of production will rise up. Don’t this idiots ever go to the movies? Of course, as you probably have figured out, the world of Yaron and the world of the terrorists collide. And it’s a shock to Yaron who, apparently for the first time, has to kill fellow Israeli’s. It’s something he doesn’t understand. It’s something that makes no sense to him. All right, okay. I’ve had more than a bit of fun with deconstructing the movie and in some ways I haven’t been fair. Like The Rover, Policeman is a rather intriguing and fascinating movie. The tone may be a bit wobbly, the point of many of the scenes may not always be clear, but once it starts, it does grab you and you just have to see where it all goes. And there is something very powerful and emotionally wrenching in the final scenes of violence and the lost look on Yaron’s face. At the same time, like The Rover, I’m not sure what it all adds up to, what the filmmakers in either film were trying to say or do, which might not be a problem except that the filmmakers, especially Lapid (maybe even more so Lapid), did seem to be trying to do or say something. Still, I do recommend it. Like The Rover, there’s something about it all that is just so involving and absorbing. With Yiftach Klein as Yaron and Michael Aloni (seen most recently here in Out in the Dark) as Nathanael, the leader of the terrorists.